Northern Ireland in 2017 offers a multitude of places to visit and things to do that will appeal to tourists and locals alike. Also referred to as Clochan na bhFomhorach or Clochan an Aifir, the Giant’s Causeway is a place where around 40,000 basalt columns interlock, the consequence of a volcanic eruption back in ancient times. 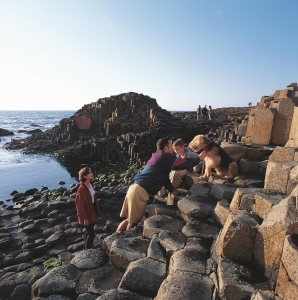 Located on Northern Ireland’s northeast coast in County Antrim, it is the country’s only UNESCO World Heritage Site. At the British Travel Awards in 2015 it won the award for the UK’s Best Heritage Attraction, thanks to the wealth of natural and local history it harbours. You can book your Giant Causeway tour with Odyssey Coach Tours and experience the beauty of the North coast. Game of Thrones is one of the hottest television shows of the decade, and it’s mostly filmed in a number of locations in Northern Ireland. Tourists can now visit as many as twenty of those key filming locations on the Old Castle Ward demesne, such as the likes of Robb’s Camp, Walder Frey’s Twins and Winterfell Castle, and the attraction is just 2 hours away from Dublin and as little as 40 minutes away from Belfast. Falls Road is the primary road that runs through the west of Belfast from Divis Street in the city centre all the way through to the suburb of Andersonstown. Falls Road has a rich history behind it, and is particularly notable for its street art and murals that are a reflection of the history of Northern Ireland. Navan Fort is the name of an ancient ceremonial monument located close to Armagh. One of the key archaeological sites in the entire country, Navan Fort, also known as “Emain Macha”, is an important place in the history and legend of Ireland. It was supposedly home to the Red Branch Knights. Navan Fort is one of the sites in Northern Ireland that early sources identify as being a prehistoric provincial capital. Down Cathedral, otherwise referred to as the Cathedral Church of the Holy and Undivided Trinity, and sometimes as Saint Patrick’s Cathedral, due to the belief that it was the patron Saint of Ireland’s last resting place, is situated around ten miles from Dundrum in County Down. Long the Earls of Antrim’s ancestral home, Glenarm Castle is now open for hospitality days and corporate entertainment. Features include a beautiful walled garden that dates from the 18th century, making it one of the oldest such gardens in Ireland.